After a long holiday season with lots of heavy food, maybe you're craving something lighter? (Not me, really - I'll gladly have some pasta.) 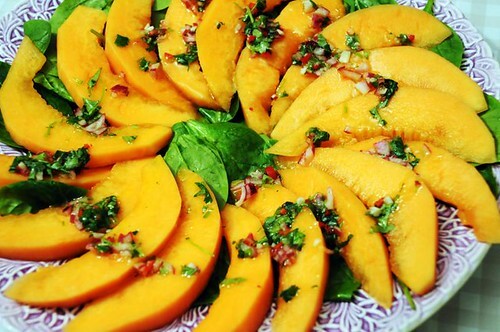 This melon salad is really tasty - it works well as an appetizer or a side dish. I prefer it alongside a juicy steak, but grilled chicken would also be good - or fish, for that matter. You could add other fruit too - I bet some sliced pear would be good. It's very versatile. Rinse the spinach and place it on a platter. Peel and slice the melon and arrange on top. Finely chop chilli, red onion, garlic and coriander, and mix with the juice from the limes and the olive oil. Season with salt. Drizzle on top of the melon. Mmmmm, I love almost everything with chili, lime and coriander!